The TTABlog®: TTAB Test: How Did These Three Section 2(d) Oppositions Turn Out? TTAB Test: How Did These Three Section 2(d) Oppositions Turn Out? Here are three recent Board decisions in Section 2(d) oppositions. I'm not giving any hints this time, so you're on your own. How do you think these cases turned out? [Answer in first comment]. Constellation Brands U.S. Operations, Inc. v. LeVecke Corporation, Opposition No. 91223426 (November 15, 2018) [not precedential] (Opinion by Judge Cynthia C. Lynch). [Section 2(d) opposition to registration of DUBOIS for "distilled spirits," in view of the registered mark CLOS DU BOIS for wine]. 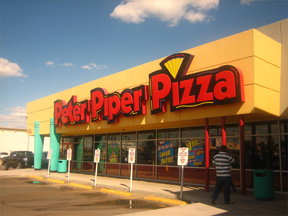 Peter Piper, Inc. v. OTG Experience, LLC, Opposition No. 91230289 (November 15, 2018) [not precedential] (Opinion by Judge Marc A. Bergsman). [Section 2(d) opposition to registration of PETER PIPER for "Motor vehicles, namely, automobiles that accepts orders for, dispenses and packages for delivery various food and retail items; Order fulfillment services; Wholesale and retail store services featuring mobile vending machines for order fulfillment; leasing and rental of mobile vending machines; Mobile vending in the field of convenience store items; and Mobile automated machine that accepts orders for, dispenses and packages for delivery various food and retail items; Vending machines, mobile vending machines, and automatic vending machines," and the mark and PETER PIPER SMARTRUCK for the services listed above, in view of the registered mark PETER PIPER PIZZA for pizza and restaurant services]. Del Monte Foods, Inc. v. Yordan Bojidarov Dabov, Opposition No. 91233082 (November 9, 2018) [not precedential] (Opinion by Judge Michael B. Adlin). [Section 2(d) opposition to registration of the mark DELMARTE & Design for "tea," in view of the concededly famous registered mark DEL MONTE, in various forms, for fruits, vegetables, soft drinks, fruit juice, and other products]. All three oppositions were sustained.